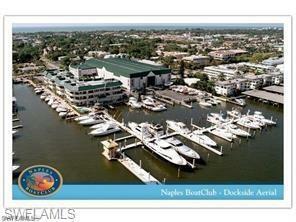 Significant wet slip offering at the upscale Naples Boat Club. Current renter is paying $1,386.00 per month. WS 40 measures 55' L x 19' W and is situated with easy water access and a boardwalk to the luxury clubhouse and pool. Amenities include beautifully decorated clubhouse with showers, laundry room, heated pool, on-site restaurant, fuel dock and service provider. Private gated boardwalk to the boat slips. Just minutes to the Gulf with NO BRIDGES. This fantastic location is within a few blocks to Old Naples shops, dining and the magical Naples downtown of 5th Avenue! Cambier Park is also just a few blocks with Tennis, Extensive Children's Playground, and Theater activities. Dogs are welcomed. Call for entry and showing.